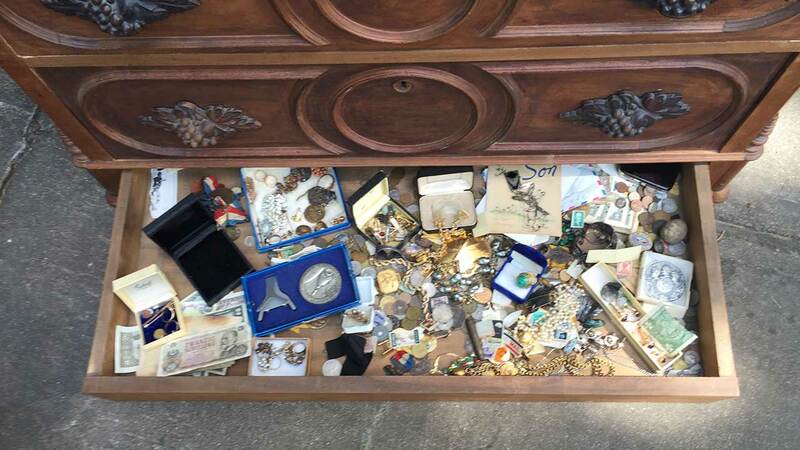 In one of the drawer, gold and silver coins, diamonds and emeralds, gold jewelry, war medals and lots of family valuables were found. MISSOURI CITY, TX (KTRK) -- You never know where you'll find hidden treasure. For a Bellville man, it was in something he bought at an estate sale, much to the delight of the item's previous owners. Emil Knodell, who buys antiques and collectibles as a hobby, bought a dresser at Premier Estate Sales in Missouri City on Saturday. As he was loading up the dresser to take it home, he heard what sounded like a slot machine inside. "He asked for help loading it," said Jeff Allen, of Premiere Estate Sales. "As soon as we laid it down, it started making all this racket on the inside." When they looked a little more closely, they found in one of the drawers gold and silver coins, diamonds and emeralds, gold jewelry, war medals and lots of family valuables. "When you look at the front of it, it looks like it has three obvious drawers with molding on the base, but the bottom has a secret drawer that opens up," Knodell told ABC News. Premier Estate Sales then contacted the original owners, who had no idea about the treasure that was in the dresser, but were excited to learn about the find. "I bought the chest drawers. I didn't buy those things. If I kept them, I would never feel right about it. There would be a cloud over the whole thing. It's a feeling more than anything else," Knodell said. All of the items in the drawer will be given back to the dresser's owner this Thursday.